So, I know yesterday's single-serving muffins were pretty cool and all, but ummm, this recipe is slightly cooler. And let me start out by saying that I am super skeptical of gluten-free cookies. Skeptical in buying them at the store and nervous to make them on my own. I've come upwitha fewrecipes that have more than satisfied my cookie cravings but there is a specific texture I still had yet to create or find. 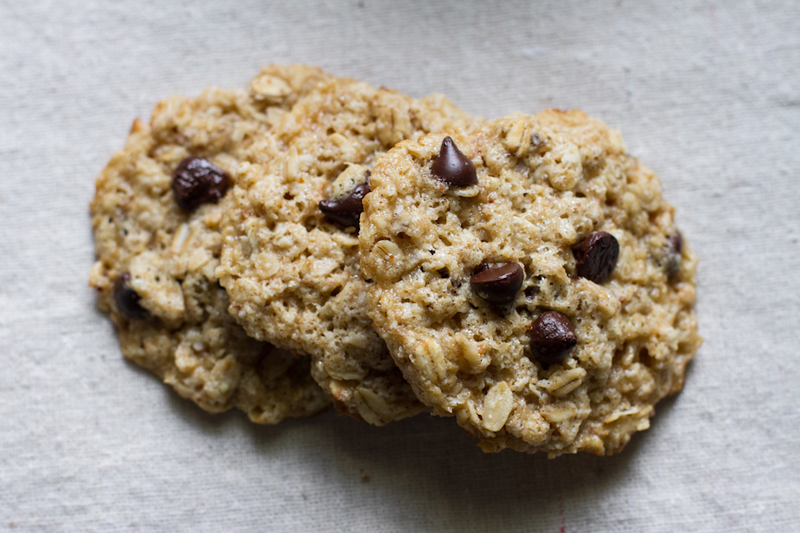 The chewy, gooey, sticky oatmeal chocolate chip cookie texture. This recipe solves that problem. The oatmeal cookie of my dreams. The best gluten-free cookie I've ever eaten. Not to mention vegan, single-serving, and can be made in 1 bowl with 1 fork using minimal ingredients in about 3 minutes. The most non-fuss cookie ever. If I had the choice between a regular chocolate chip cookie and an oatmeal chocolate chip cookie I will pick the oatmeal cookie 100% of the time. Rolled oats add such a nutty delicious flavor and an addictingly chewy texture you just can't get when using flour alone. The best part about this recipe is that you can bake it exactly to your liking. Since there is no egg it doesn't matter how "done" it ends up. Underbake it, overbake it, eat the raw dough for all I care! Whatever you want! My cookie texture of choice has a slightly crispy edge with a doughy, tacky center. Not tacky like socks with sandals but tacky like sticky and chewy. I could eat these all day for the texture alone! And trust me this didn't come after one lucky try. This recipe was not an accident. I made at least 7 trials playing with very small ratios of flour, oats, oil, sugar, etc. until it was just perfect. Well, perfect for me, anyway. But hopefully you like it as well. This cookie is the real deal. Or maybe it's been so long since I've had a real cookie that my brain has been a skewed vision of what a real cookie is. Preheat your oven to 350* F and take out a 3 or 4-inch ramekin dish. In a small bowl mash the coconut oil, brown rice syrup, muscovado sugar, vanilla, and baking powder together until fully combined + creamy. Do not use melted coconut oil. Press firmly into the ramekin dish then top with a small pinch of flaked sea salt and bake for 11-13 minutes [for a 4-inch ramekin] or less/more depending on your texture preference. For a 3-inch ramekin bake for 15-17 minutes. Remove from the oven and let cool for at least 7-10 minutes. The cookie will firm up and become chewier as it cools. Serve slightly warm or fully cooled. The cookie will stay chewy when fully cooled. notes/substitution: The brown rice syrup helps create a chewy texture but maple syrup will also work. For making 3 cookies instead of the cookie pie see directions below. Don't feel like smashing the dough into a ramekin dish? Roll 3 balls of dough, place them on a cookie sheet 2-inches apart, slightly flatten them, and bake for about 7-9 minutes [at 350*]. Let them cool for 5 minutes then transfer to a cooling rack. The cookies will firm up as they cool and stay chewy once fully cooled. And then there's the option of serving the cookie pie a la mode. The ice cream cools the warm cookie making it even chewier, while at the same time melting into ice cream soup. My two favorite things together at last. And here is the whopping sinkful of dishes you'll have to clean when you're all done. Why aren't you in the kitchen yet?